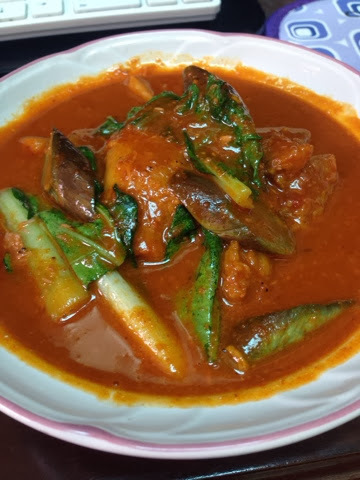 I'll give a quick and easy steps on how to cook Kare-kare. It is a Filipino dish originated from Pampanga, Philippines but it is widely cooked all over the Philippines specially when there is gatherings and events. • In a stew pot, cook the meat until its tender. • Remove the meat and stocks from the pot, use the same pot add some oil and sauté the onions until translucent. • Add the Shrimp paste, let it cook. Sauté the vegetables on the shrimp paste and remove the vegetables. • On the same pot add the Peanut butter, Add the stocks. Let the peanut butter melt. • Add the Meat, let it simmer for a couple of minutes. Add the vegetables, and let it simmer until the vegetables are cooked. One thing i liked about this is that i really don't need to pair it with Bagoong anymore. ☺️ I hope you enjoy cooking as much i enjoyed it.